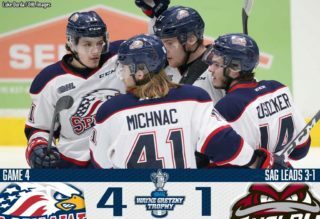 Saginaw, MI – The Saginaw Spirit have taken a 2-0 series lead over the Sarnia Sting. Four different players for Saginaw would register a goal in Saturday’s 5-1 win in front of sell-out crowd of 5,815 fans at The Dow Event Center. 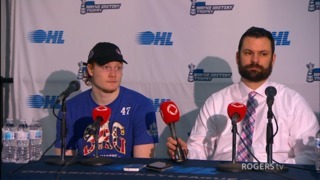 It’s the first time the Spirit have won the first two games of a playoff series in 10 years when they swept the Guelph Storm in the Ontario Hockey League Western Conference quarterfinals. Captain Damien Giroux got things started with his first-period goal at 5:42. 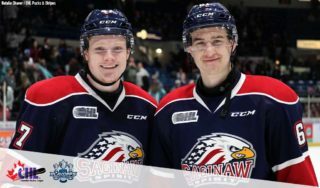 Receiving the lead pass from Bode Wilde less than 20 seconds into the man-advantage for Saginaw, Giroux took it backside for his first goal of the playoffs, as well as the first of his three-year career. So far this series, Wilde has recorded two goals and two assists for four points, tied for the second-highest total among Spirit players behind Owen Tippett. Tippett picked up his second assist in two games at 8:42 when coming down on a 2-on-1 rush with Cole Perfetti. Perfetti, the reigning OHL Rookie of the Month for March, found the open target to the right side for the 2-0 lead. Credited with the secondary assist was Hayden Davis for his second point since returning from injury on March 8. The Sting went on the power play at 3:19 but were unsuccessful for at the time was the sixth consecutive time this series. Shots on goal favored Saginaw, 16-7, after 20 minutes. The second of four power plays given to the Spirit ended in Tippett’s third goal of the series. Tippett, the 2017 Florida Panthers first-round (10th overall) draft pick, went top shelf over the glove of Sarnia’s Ethan Langevin with 3:21 to play in the second period. The 20-year-old from Peterborough, Ontario, received first-star honors Thursday on two goals and one assist. Saginaw killed 3:45 of penalty time and tallied 18 shots on goal in the second. Wilde, the 2018 New York Islanders second-round (41st overall) draft pick, provided the fourth unanswered goal 1:43 into the third period. The Plymouth, Michigan native faced little opposition when skating towards the net from the slot as the Spirit were on their sixth man-up opportunity. Wilde finished the regular season as the team leader in assists at 51. Ivan Prosvetov notched 33 straight saves before Sarnia went on the board at 11:13 on 2018 OHL Priority Selection first-round (19th overall) pick Jacob Perreault’s first goal of the series. Prosvetov, the 2018 Arizona Coyotes fourth-round (114th overall) draft pick, got his first career OHL playoff win Thursday on 27 saves. He would finish with 37 stopped shots Saturday. Giroux scored his second goal and third point of the night with 5:43 remaining and would go on to accept first-star honors. A combined total of 19 penalties were issued to both clubs as the Sting went 0-for-5 on their man-up situations. 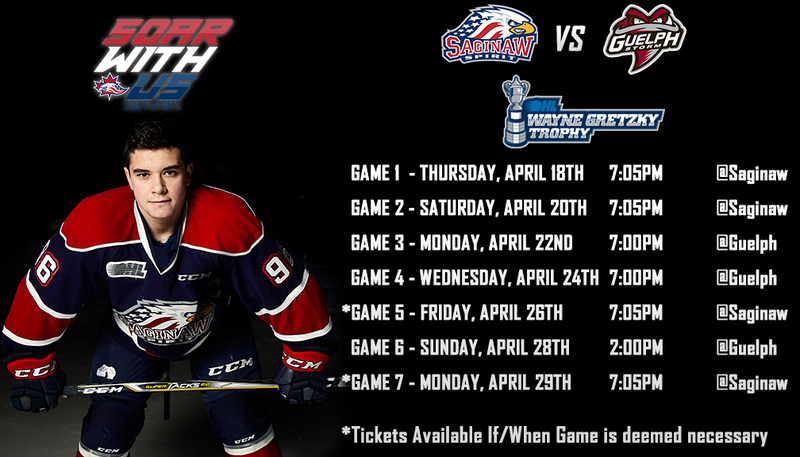 The series now moves to Sarnia for two straight games starting Tuesday, March 26, at the Progressive Auto Sales Arena. Game Four is scheduled for Thursday, March 28, while Game Five, if necessary, would be Saturday, March 30, at The Dow Event Center. Listen live on the flagship WSGW 100.5 FM Talk & Sports and fmtalk1005.com with Joey Battaino and Dennis Desrosiers. Pregame coverage begins at 6:50 p.m. (EST). The Spirit finished with one win and two losses on the road in Sarnia during the regular season, most recently taking a 6-2 decision on March 12.